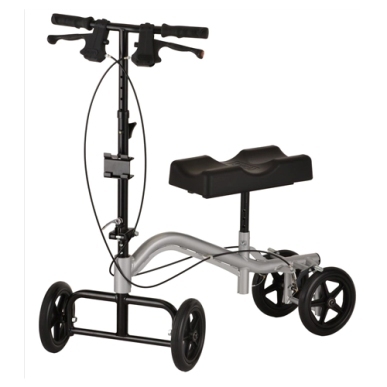 The Nova Knee Cruiser TKW-12 (silver) is an excellent mobility device for foot or ankle injuries when the affected area cannot bear weight or has limited weight bearing precautions. It can be a great long or short term alternative to crutches or folding walkers that can have adverse affects such as back or under arm pain from extended use. The Knee Cruiser allows the user to maintain an active and more independent lifestyle which will help them progress to a quicker recovery. • Handle height adjustable from 31" - 37"
• Knee pad height adjustable from 17" - 22.5"
• For users 5'2" to 6' 4"
• Overall weight is 26 lbs.